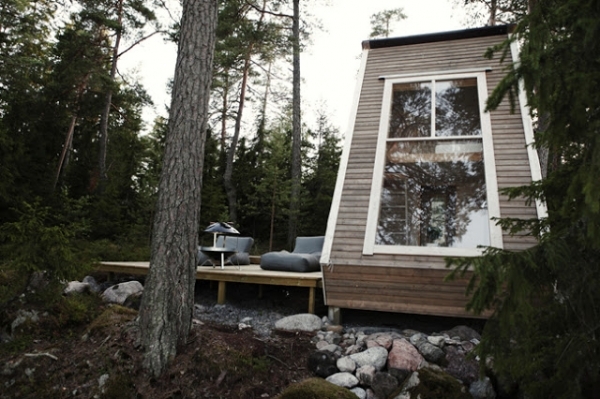 This cabin design is pure awesomeness. It is simple, beautiful, and cozy, making it a wonderful retreat. 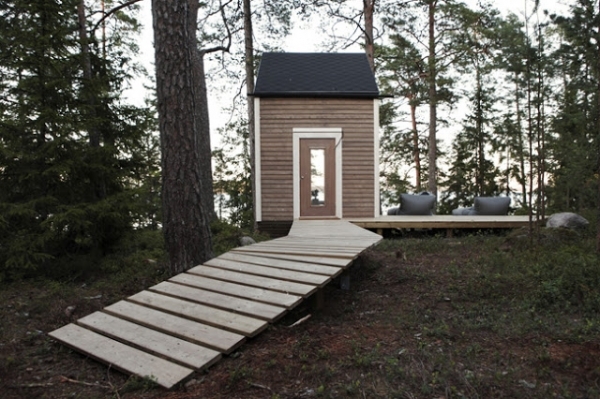 The cabin has been created by twenty one year old industrial design student Robin Falck, and it is probably the only way we would ever go camping. The geometric shape of the structure is positively stunning: it attracts and fascinates. The size of the cabin is small but fantastic. It is warm and unobtrusive, allowing the surrounding nature to be the focus and focal point. We love the natural wood used in the decking and in the construction of the house. On the deck, two gray lounge cushions and a stunning fire pit provide a wonderful place to relax. Beautiful trees and rocks encircle the home in natural beauty. This cabin design uses lovely wooden planks to create a gorgeous walkway up to the house, connecting its design to the exterior of the home. We love the outside appeal: the natural wood, white trim, and black roofing, look absolutely fantastic in the forested surroundings. 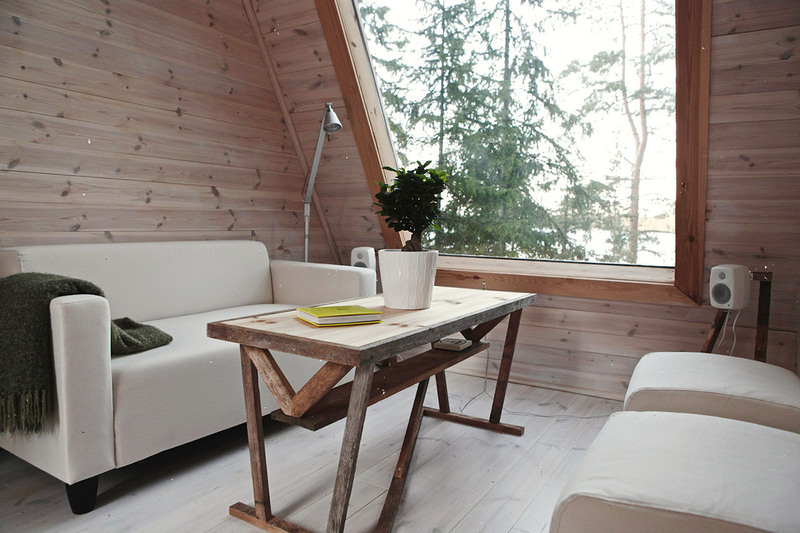 The singular large window is delightful, providing natural light and wonderful views. Inside the home the wood continues. The hardwoods are sleek and resplendent, and the bed is perfectly placed for waking up to the beautiful scenery: absolutely gorgeous. The beauty lies in the simplicity of the architecture and the interior décor. 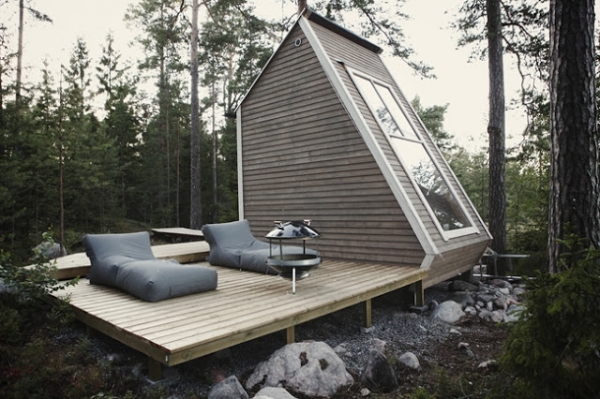 The size of the cabin provides a warmth and coziness, the geometric shapes add a sleek touch, and the natural wood, grounds the cabin in an earthy aesthetic. 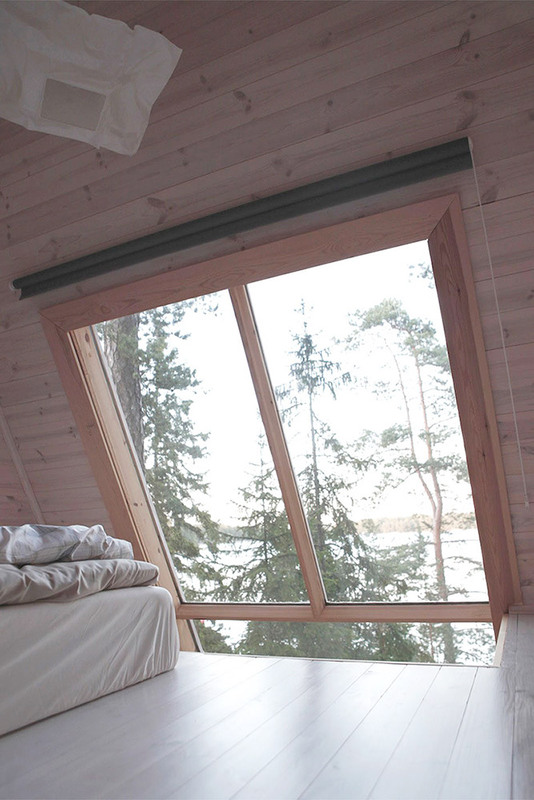 We can imagine lounging on the deck, staring out at the beautiful scenery, and sipping our morning coffee. At night, we would fall asleep, looking at the nighttime sky, and listening to the sounds of nature: a delightful respite from the hustle and bustle of everyday life.